Last week it was announced that the once-idyllic Maya Bay in Thailand will be closed to tourists from June due to environmental concerns. Our CEO Sam Clark was quoted in the Guardian sharing the ETG line on the matter. As a travel company trying to tackle the effects of over-tourism, we welcome the beach’s closure for recovery and conservation efforts – and urge travellers to seek out the innumerable equally beautiful, lesser-visited spots in Thailand and beyond. If you follow travel media (or have recently visited Venice or Barcelona in peak season), you’ll probably be familiar with ‘over-tourism’: excessive visitors to a destination to the point that locals feel their quality of life has deteriorated. From a traveller’s perspective, it means that the experience of visiting is intensely crowded (and, often, unpleasant). With the rise of budget airlines and, of course, our ever-growing population, over-tourism is perhaps an inevitability. Yet a huge part of the problem is that people flock to the same handful of sites within a given country, seeming to forget that there is so much else to explore. It’s perhaps not so much over-tourism as an over-concentration of tourists in certain places and at certain times. If you’re interested in finding out more about the lesser-visited sites in Thailand, why not download our ? We’ve always championed travel to lesser-visited areas within our destination countries. While this does encompass the very far-flung, off-the-beaten-track locations, there are also fantastic little-known corners that you don’t need to spend hours on a dirt track to find. In fact, often they are extremely accessible and can offer very similar experiences to a more popular spot. A great example of this is the Angkorian Temples: while most people will automatically go to Angkor Wat, we also encourage our clients to explore the 1,000+ other temples in the astounding Angkor complex. You still see the majestic architecture and get a sense of that impressive history, but minus the hordes of tourists. It’s so easy, but surprisingly few people do it. Of course, we do accept that there are some sites which, despite the crowds, you simply have to see – Angkor Wat being one of them. But places like Maya Bay shows how important it is to take these so-called ‘must-see’ sites with a pinch of salt, as the experience of visiting can be removed from their idyllic image in the public imagination. We are pleased that the Thai authorities have acted now. As Sam said, “[they] have the benefit of seeing what unchecked development over a 40-year period did to regions of Spain and other places, so they can hopefully learn from that.” If you are looking to discover what really makes Thailand so special, to see its astounding beauty with far fewer crowds, please don’t hesitate to get in touch with one of our experts for free, no-obligation travel advice. One great way to avoid crowds on Thailand’s world-famous beaches is choosing a hotel with its own. 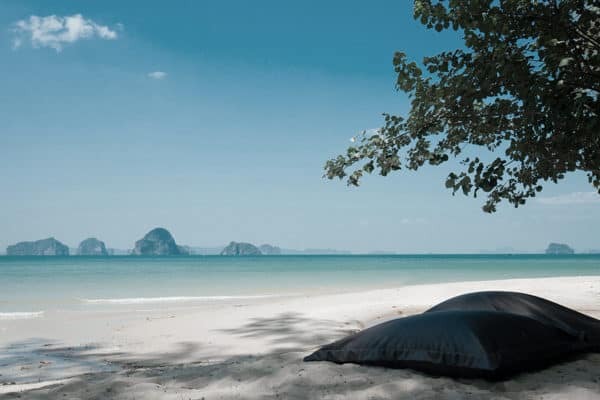 While no beach in Thailand is officially private, this will drastically reduce the number of people who can access it and allow you to experience Thailand’s natural beauty in peace. The Surin Phuket (formerly The Chedi) lies discreetly hidden in Pansea Bay, one of Phuket’s finest and most secluded beaches. The resort is situated in a bay around the beach, tropical palms meet powder white sand and the water is clear and turquoise blue. Located on a wide stretch of powdery white sand beach, the Tubkaak is both private and peaceful. Built in typical Southern Thai style, the design and architecture has protected the beautiful natural environment in which the resort sits. The Anantara Rasananda is a tropical beach hideaway superbly located on the white sandy shores of Koh Phangan. Luxurious villas are surrounded by towering coconut palms and verdant gardens with the ocean just seconds from their door. Enjoy the beautiful Koh Phangan beaches well away from the full moon crowd!